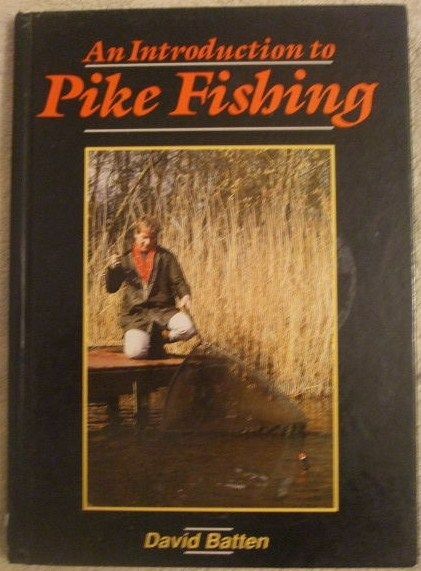 First edition, first print hardback of AN INTRODUCTION TO PIKE FISHING, by David Batten and published by The Crowood Press, Wiltshire in 1989. Illustrations by the author. The book is in good condition (laminated illustrated boards with red lettering on front and spine) with very slight wear to the boards (minor rubbing to the corners and edges, very slight bumping and rubbing to the spine edges, the beginnings of a half inch split to the spine edge near the bottom). No dust jacket as issued. Internally, the pages are clean and tight and there are no tears and no inscriptions. "All the newcomer to pike fishing will need to know plus some ideas for established anglers. Live and deadbaiting, lure fishing, long range fishing and boat fishing. Superb colour photographs and explanatory line-drawings. A species which can grow to in excess of forty pounds, the pike has always been an attractive catch for anglers. This book will help build a confident approach to playing, landing and handling this often misunderstood fish. David Batten examines the history of the species, baits, tackle and fisheries before describing, in detail, suitable tactics for pike fishing. He emphasises the need for an understanding of any new tackle used and for the careful handling of caught pike." 128 pages. Illustrated with colour photographs and line drawings throughout.